"The Winter Frost and the Spring are united by their wonderful child, The Snow Maiden." The Snow Maiden is standing between her mother Spring and Father Frost. Half of the image is occupied by a winter landscape, while the other half depicts blooming flowers, swans, and rabbits. An emerald castle is seen in the distance. 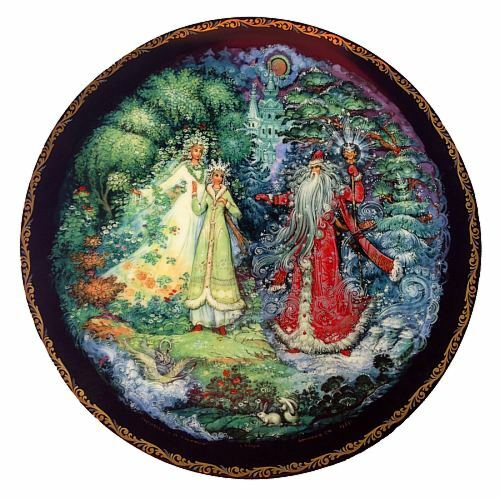 This collectible plate is based on a lacquer miniature by Kholui artist Sergey Dmitriev and is the eight plate in the series devoted to the fairy tale "The Snow Maiden". The plate is in excellent condition and comes with the original documents and box.